Residents resisting eviction from the Dey Krahorm area in Phnom Penh pled for more time and further negotiations Wednesday during a news conference, saying a 24-hour deadline to accept a new $20,000 compensation offer was too short. “We appeal for officials to give us more time for husbands and wives to discuss such an important decision within the family in order to settle this problem peacefully,” Chan Vichet, a representative of the re­maining Dey Krahorm residents, told reporters. The government signed the 3.6-hectare Dey Krahorm area, near the Russian Embassy, over to the 7NG firm in a 2006 agreement. Since then, 7NG and authorities have been working to clear residents out of the prime city-center area to make way for high-end residential and retail developments. Originally, officials say, 1,465 families lived in Dey Krahorm and now only 91 remain. The community, however, puts the number remaining at 151 families. Until this week, 7NG had been offering the remaining families housing on the city’s outskirts or $15,000 in cash. On Monday, authorities upped the offer to $20,000, but noted that the families had 24 hours to accept before the offer dropped back down to $15,000. Chan Vichet told reporters that 10 families had gone for the new deal, but the others need more time to consider. Deputy Municipal Governor Mann Chhoeun confirmed Wednes­day that some families had accepted the new cash offer. 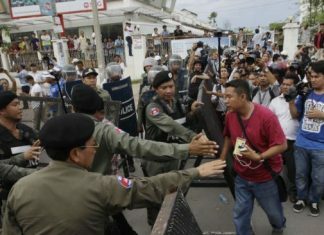 Angry vendors from a market adjacent to Dey Krahorm, and which some call Phsar Dey Kra­horm and others call Phsar Build­ing, also told reporters on Wednesday that they had been told that morning to pack up and leave the area. A man in a truck used a loud­speak­er to announce that the vendors must move out by the end of the day because workers would start clearing the site today, vendors said. “They cheat us!” said Troeung Phally, who sells canned juice and ice and said she has been renting a stall in Phsar Building since 1994. The market land is part of the plot being claimed by 7NG, said David Pred of the housing rights organization Bridges Across Borders. Mann Chhoeun, however, said that the market vendors’ eviction might not be immediate. “We are [very] flexible. Our hearts are made from meat, not from me­tal,” he said.